If you are riding a fuel injected Harley Davidson, fuel filter replacement is an important service point that should not be overlooked. Typically, replacement of this filter is recommended at forty or fifty thousand miles. The service manual for your year and model will list this filter replacement in the service schedule. The fuel filter is relatively cheap and should be replaced; not cleaned, at every specified service interval or anytime the fuel pump assembly is removed from the fuel tank. Often, blocked fuel injectors are a direct result of fuel filter neglect. Rider neglect for fuel filter replacement may be mostly due to the difficulty level of the service. For some models a specialty tool is also needed to remove the fuel door. However, a factory service manual is the most important tool that is needed to complete this maintenance procedure. A fuel door gasket or o-ring will be needed to complete the job; as well as small fuel line step clamps depending on the year and model. It is also highly recommend to replace the fuel door retaining hardware depending on year and model. Start by purging fuel pressure from within the system. Unplug your fuel pump module connector. Start the motorcycle and let it idle until it stalls. Then, hold the start button for a few more seconds. Now, disconnect your battery’s ground cable. When directly dealing with gasoline, this could not be more important. The fuel door is located beneath the motorcycle’s dash assembly on any model. Remove the fuel door and the fuel pump assembly. The steps for pump assembly removal vary from model to model. The new fuel filter is often sold as a kit. Again, depending on the year and model. The filter will often come with o-ring(s). After the filter is replaced and the pump assembly is correctly positioned in the fuel tank with a new gasket or o-ring, secure the fuel door with new retaining hardware or with the specialty tool. 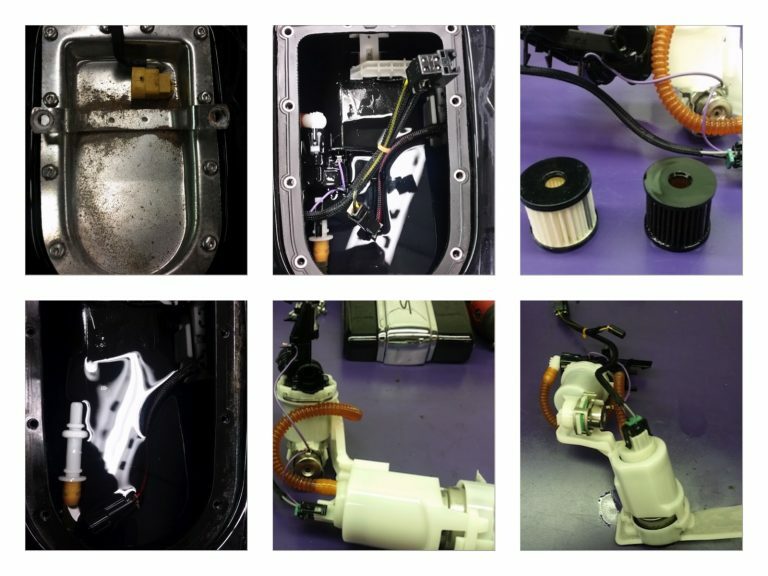 Fuel filter replacement can be a little more challenging than other Harley service points but with a service manual and the correct tools, a rider can keep his motorcycle well maintained while saving $$. I’ve got a 96 Electra Glide EFI. Sometimes I have to give the throttle a few twist while holding the start button, then she will start up, but she’ll run crapy for a few minutes the smooth out. Other times she starts up and runs right. Also sometimes when I give her a quick twist on the throttle going down the road she’ll hesitate for a second or two, other times she doesn’t. What advice can you give me. It does have the Magneti merelli system. Hi Walter. Unfortunately, there may not be much that you can do with your Magnetti Marelli throttle body. You can attempt to adjust your IAC, throttle stop, or air bleed screws but usually if you can make an improvement in one area, something else will change for the worse. Check out this You Tube video from Thunder Max to familiarize yourself. Best, way to resolve definitively and for good, is to change over to a carburetor. 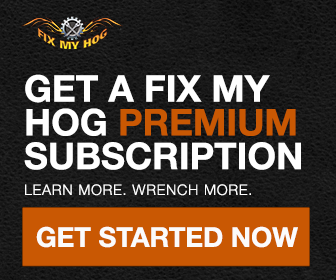 You will need a carb & intake, harness, ignition module – to start. It is expensive, but much cheaper than purchasing a new(er) bike. Hi James. Sounds like you have to replace your inner primary bearing seal. Depending on your mileage, you may want to consider belt & pulley replacement at this time. You will need to do a fair amount of work to remove your inner primary. Best to take care of everything you can while you are in there. Here is a list of what you should be considering. When replacing the fuel filter make sure you carefully check the fuel lines in the tank. Sometimes they’ll rub against the inside of the tank and wear a pinhole in them that affects the fuel pressure and/or flow.